The countdown to Thanksgiving has begun and the Soup Lady is auditioning old-fashioned crowd pleasers for the big day. Trendy, chi-chi, healthful or even moderately nutritious just won't do for this biggest of food holidays. No - calories, cholesterol and other modern standards of culinary decency be damned. Dishes offered on this holiday ideally should be made of a combination of the following attributes: seasonal produce, family tradition, rich & decadent, extravagant presentation, and/or warm and spicy. At the very least, it should a color of the season. Today's recipe is pale orange in color and that's about it. 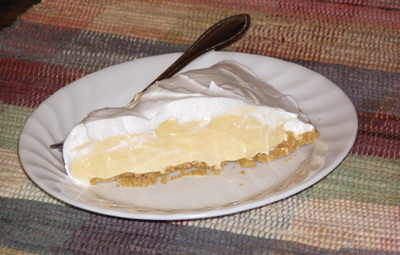 1 9-inch graham cracker crust, baked. 1/4 cup plus 2 tablespoons Tang powder. 1 8-oz tub Cool Whip. 1. Mix the milk, sour cream, and Tang together. 2. Fold in half of the Cool Whip. 3. Spoon into the pie shell. 4. Top with the rest of the Cool Whip. As the former frat house resident who actually assembled this concoction points out, Tang is about as adventurous as you can get when it comes to instant drink powder as a dessert ingredient. And how was it? It was heavy in every sense of the word: heavy to lift out of the refrigerator, heavy enough by the forkfull to require a better-than-average grip on the cutlery, heavy on the stomach after it goes down and heavy on the concience for serving it to your friends and family. It's also waaaay too sweet and leaves you with unpeasantly sour aftertaste. On the plus side, it was very creamy and had a delightful pale orange color but that is not enough to save it. Recommendation: leave this one alone or at best, treat this as an urban myth. Instead of serving this at the end of a good meal, print out this picture, show it around and speculate about it for a bit of post-prandial entertainment. The Soup Lady is no home economist so please don't consider this as official nutritional labeling, but a rough additon of the total calories of the ingredients divided by 8 gives you about 600 calories per serving. Do ya feel lucky? Well, do ya?